Stop right there…put the leftover Halloween candy down. I have something better to offer! 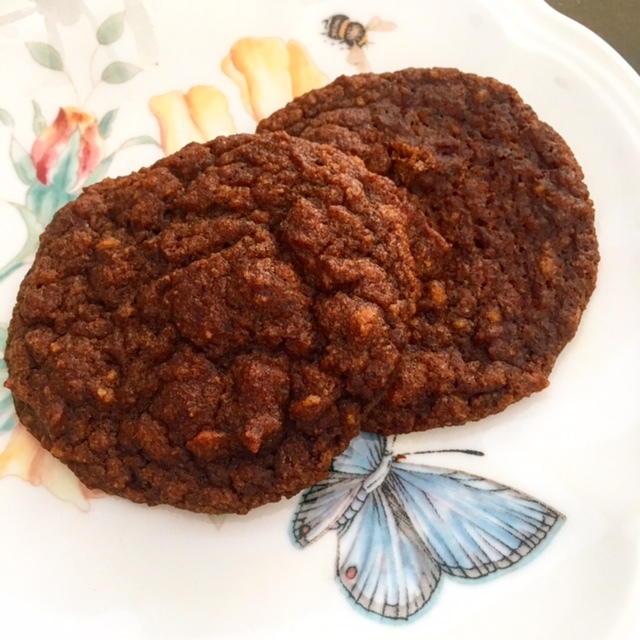 Try out my gotta-have-it Paleo Pumpkin Cookies to get your sweet-tooth fix this week. This recipe will wow you with fall flavors, but free you of all of the processed sugar, artificial colors and sweeteners, and unhealthy fats and oils found in most treats. This recipe is vegan, grain free, gluten free, dairy free, and paleo compliant. Combine the ingredients in the food processor and it will take you less than 5-minutes to prepare this recipe. When you place the batter onto the baking sheet, be sure to leave plenty of space in between each cookie as they tend to spread out once they heat up. These cookies are soft, chewy and light so I say 3 of them equal 1 serving! Lastly, since this recipe is vegan and there are no raw eggs included, feel free to indulge in the delicious batter. You can even use the batter as a vegan pumpkin pudding [hmmm…maybe that will be my next recipe I post]! SCD – Yes, but use fresh pumpkin or replace it with butternut squash since canned pumpkin is illegal. Also, the bananas must be ripe with black spots. Low FODMAP – Yes, but use an unripe banana. Also note that 1/2 cup of pumpkin puree is medium FODMAP so intake should be limited. Replace honey with maple syrup. Keto – Yes, as each cookie has 4 g of net carb. This recipe makes 14 cookies. Each cookie contains: 60 calories, 5 g carbohydrates, 1 g protein, 4 g of fat, 1 g of fiber. In a small bowl, mix together the spice blend and baking soda. In a food processor, add the rest of the ingredients and blend until well combined. Add the spices and baking soda and mix in the food processor for another minute. Spoon the batter onto the baking sheet, leaving plenty of space between each cookie. Bake for about 23 to 26 minutes. Allow the cookies to cool on the pan for a few minutes and then transfer them to a cooling rack.